After one year of planning our apartment and office complex was raised on the outskirts of Rosenheim in the industrial park of Schwaig. The apartment building features 14 individual apartments accessible by common balconies, and in part reaches to a height of more than 2 stories. With small gardens it opens up to the countryside in the west. The comb-structured office building, on the other hand, is orientated toward the industrial park in the east. The tamarack wood paneling on the building facade strikes a balance between the neighboring houses built in the regional tradition and the architecture of the industrial park. A common area stretches between the two buildings. Beautified with plant life, it is divided into a microclimate-regulating pond as well as areas to sit or play. In the summertime, a large canvas tarp, known as Toldos, can be drawn over the entire area to provide shade. Some magnificent celebrations can be held here. Great entrance hall, conceived as a sort of climate zone, opens up to all offices and rooms, which are entered from balconies stretching the length of the building. Upon Completion of the “HmT”, the “Haus mit Teich” (House on the Pond), for the building model “Living and Working in Rosenheim”, a fascinating idea was realized. The combination of an office building with living quarters that are flexible in their use is cutting edge. Shortly after their completion, the office building and apartments were already completely occupied. 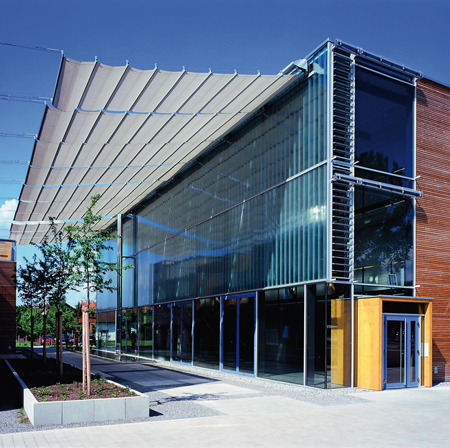 The office building is used by the engineering firm Duschl Engineering and the structural design firm Fichtner & Köppl. The apartments are offered first and foremost to employees of Duschl Engineering and to students, interns and diploma thesis students who work and are trained at Duschl Engineering. This project also represents an ecological milestone. Plus the costs for investment and operation of the complex are very economical. A special feature is the connection of the apartments to the office space via a network for optimal exchange of information. The inside of the office building is much different than in other office buildings. There is no multiple layer flooring, no heating registers or air conditioning and ventilation installations; instead a person will notice unfinished concrete surfaces and extensive use of wood. As in countless other projects and applications, we could also use our longtime experience in regenerative and efficient energy generation in the technical planning of our own building. 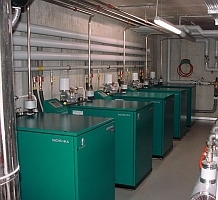 In the cellar in the office building there is a peak-load boiler and five small natural gas operated cogeneration units, each of which produces 5 kW of electrical energy and 12 kW of thermal energy. A 9,5 m3 storage tank optimizes the running time of the cogeneration units. 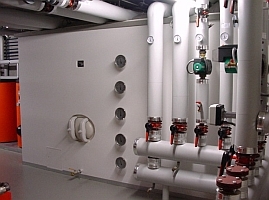 The apartment building is equipped with conventional radiant panel heaters, which are supplied by the cogeneration unit in the office building. Considerable energy costs and over 30% of CO2 are saved through the combination of power and heat generation. 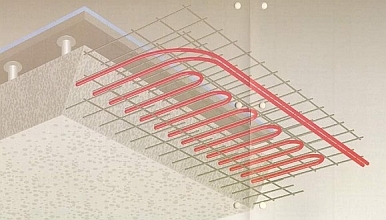 A total of 18,000 meters of water-filled lines is incorporated into the concrete ceilings so that the concrete core can be held closer to the desired temperature of the room. When temperature changes occur in the room warmth will be either radiated from or dissipated into this core. Therefore temperature changes will be moderated (self-regulation). At the same time, warmth is stored and exchanged between the different adjacent areas in the building. All levels of the office building including the foundation floor and the top-floor ceiling are included in this process. Separate heaters are only installed in side rooms. As opposed to equipping the building with conventional heaters, more floor space is available for use and also the maintenance and cleaning efforts are reduced. Because of the reinforced floor panels used for taking advantage of the concrete core, sound dampening is also optimized. The offices are cooled indirectly with ground water. Therefore chillers are not needed. The building rests in ground water, into which surplus heat from the intermediate floors is directed using outlets in the foundation floor. The savings from the absence of a separate ventilation and cooling system impact initial costs to the tune of 150,000 € and operating costs about 8000 € per year. with respect to the annual rainfall, never even reaches the drainage system. The remaining amount is used mainly as supply to the pond and biotops. By evaporation of water at high outside temperatures a convenient micro climate is created. Big open water surfaces and the plants of the habitat evaporate water and bring a noticeable improvement of convenience. Installations on the ceiling are visible and freely accessible (lack of suspended ceiling). Power to working stations and all electrical and IT cables are brought down from the ceiling using flexible vertical cable guides. 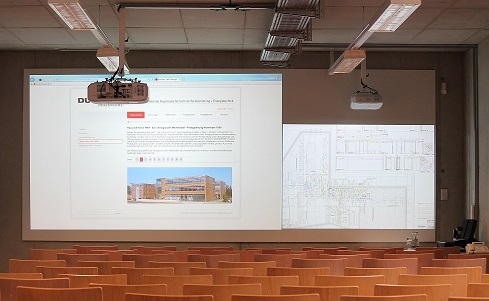 The conference rooms are equipped with electrical bus systems for lighting control offering several programmable lighting scenarios. All installations are designed in such a way that additions and upgrades can be easily made. In this way a person can limit the initial investment to only what is absolutely necessary. room for plot-/copying-services of app. 100 m² could be raised with only minimized additional costs. 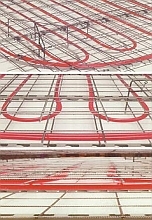 The costs for a multilayer floor construction are avoided. A sound dampening layer and screed are not needed. It is only necessary to lay a synthetic layer or carpeting over the sanded concrete. Likewise costs are saved by the use of unfinished concrete surfaces and the lack of a suspended ceiling construction. The underground parking garage and cellar, which lie outside of the building, are not specially waterproofed, since waterproof concrete, when properly installed, is really indeed waterproof. In the single office rooms the ceiling lamp glazings use cost-effective double-pane Plexiglas. The utilization of U-profile glass instead of large insulated glass panes over large surfaces of the entrance hall also proved economical.